How do you walk away from bitterness? What do you do with doubt? What happens when you’re angry with God? In The Easy Bible® Volume Two, we’ll complete the story of Jesus and discover surprising answers to challenging questions like these. Get up to speed on everything you need to know about Jesus from the transfiguration to the Great Commission, from Peter’s denial to the feeding of the 5,000. You’ll read about the woman caught in adultery and the man Jesus raised from the dead. You’ll witness extraordinary acts of devotion in the most unexpected places. You’ll understand why Jesus tangled with the leaders of religion and why they arranged for Him to be put to death. You’ll learn why the tomb couldn’t hold Him. We’ll talk about the devil’s dessert tray and you’ll learn the three things you need to know for your world to make sense. You’ll meet Zacchaeus (the “wee little man”), blind Bartimaeus, Judas the traitor and doubting Thomas. You’ll find out why Pilate was afraid. You’ll travel to Emmaus and uncover the secret that can change your life in an instant. Here’s the the story-all in one place. The Easy Bible(r) is your resource for exploring and sharing the Christian faith. This book picks up where Volume One left off and takes you deeper into your journey of faith. You’ll be inspired. You’ll be equipped. You’ll be informed. Designed for first-time Bible readers, appropriate for seasoned pros … you’ll find this book to be easy to read, but never watered down, and filled with encouragement and guidance that works in real life. 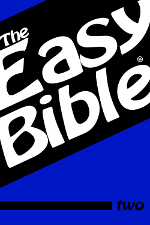 Easy Bible® is a registered trademark of ET Labs. The Easy Bible® is published under a special agreement with ET Labs, and the content contained herein is not necessarily endorsed by ET Labs. ET Labs publishes a series of applications. Please visit etdevlabs.com and biblepub.com for more information.